Reducing noise that comes from outside the home can be challenging, especially if you have windows facing a busy street or commercial area. As the need has risen for more noise reduction, the number of products available have also increased. Interior designers are more and more incorporating noise-reduction materials into stylish shades, curtains and foam inserts. A homeowner or renter can install soundproofing window treatments in a short time. 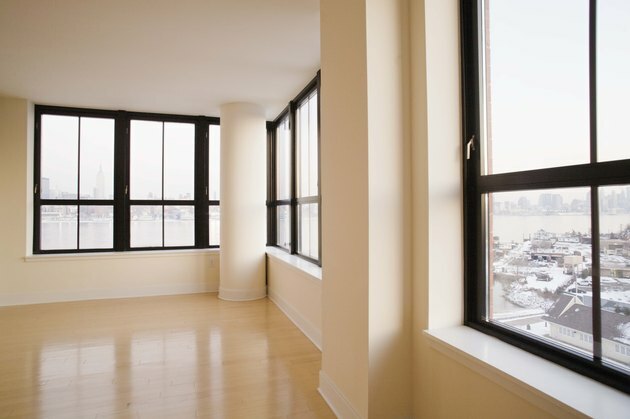 Windows can let in not only light, but unwelcome sound if not properly covered. Noise-reducing window shades are made from a cellular material. The more cells in the shade, the more noise-reduction capacity. These shades fit inside the interior window opening and block out both noise and sunlight. Typically the shades come in either single-cell or double-cell material. The sound-absorbing structure is enclosed in a fabric which comes in a variety of colors to match almost any room decor. The shades are easily opened and shut; when opened, they are still visible, in some cases taking up the upper 6 inches of the interior window. Vinyl-backed soundproof curtains are much heavier and more dense than a typical curtain and consist of fabric-covered thick plastic drapes that trap sounds. They form an insulating barrier to stop sound by providing a solid air wall: air, when tapped between a window and a soundproof curtain, helps deaden sound waves as they pass through the glass. (Double-paned windows themselves can also help reduce noise from the outdoors as long as the glass panes are insulated from each other by rubber stand offs or insulators.) Vinyl curtains are heavy, and the material must be installed so there is an air gap of at least 3 inches from the glass. The curtain must form a type of sound or air seal around the window to trap the sound. Foam sheets made from dense foam with a large closed-cell structure can be effective as sound-reduction in windows. The foam must be cut so it fits tightly inside the window opening. Once installed, these foam inserts are vulnerable to damage from being frequently installed and removed from the window. Covering the interior-facing foam with fabric can help prevent this damage.This type of window treatment works well in home theaters or bedrooms where noise is a constant discomfort. The foam is relatively inexpensive, and multiple layers can be added to increase its noise-reduction capability. The foam should be kept away from the glass to create an air trap for the sound.